What Is Gestational Diabetes And The Right Gestational Diabetes Diet? Gestational diabetes is a related condition to type 2 diabetes. And it is characterized by insulin resistance and high blood sugar levels. Pretty much the same things that characterize type 2 diabetes. So the goal here is to affect gestational diabetes with diet, by applying the same dietary changes that a type 2 diabetic would. And this is really a very effective way to control and prevent gestational diabetes from developing into type 2 diabetes. Now let’s go deeper. Gestational diabetes is usually defined at the first sign of diabetes during pregnancy. This may happen as a result to certain levels of stress during the pregnancy, or some women this may bring to light an issue with diabetes that they had before pregnancy. 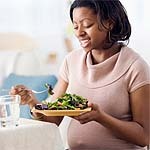 Sometimes gestational diabetes can be controlled by diet alone. While in more severe cases insulin therapy may be necessary. The reason for this is gestational diabetes equals an increased risk for developing type 2 diabetes in the future. In working with many physicians, I have had some doctors tell me that they advise their patients with gestational diabetes to think of themselves as diabetics going forward. This forces their patients to change certain things. Just to give you some statistics, about 135,000 pregnant women develop gestational diabetes each year here in the US. And it is the most common medical complication in pregnancy occuring in 5 to 14% of pregnant women. Almost half, 50%, of these women will develop type 2 diabetes later in life. In most cases blood sugar levels do return to normal levels after delivery though. However, that 50% of women with gestational diabetes that I just mentioned that will usually develop type 2 diabetes, will usually develop it about 5-10 years later. Some of the reasons for changes in blood sugar control in pregnant women are the fact that blood sugar levels fluctuate more in pregnant women than nonpregnant women, and insulin levels gradually rise to compensate for this. Blood sugar levels aren’t as tight in pregnant women, and even more-so in the second and third trimester. The reason for the onset of diabetes is in the increase in insulin levels coupled with insulin resistance. This results in the rise in blood sugar levels. Also, a defect in the amount of insulin being produced points to less beta-cell insulin producing ability. When I say a history of glucose tolerance I mean maybe higher than normal fasting blood sugar levels, that are not quite in diabetic ranges. Eat 5 small meals or 3 medium size meals per day with healthy snacks in between. A good healthy snack would include nuts such as almonds. Reduce your carbohydrates and limit them to whole foods instead of refined carbohydrates such as sugary drinks or white bread. Eat foods that are high in fiber such as green leafy vegetables. Cut back on the saturated fat and sodium intake. Drink more water. Ideally half of your body weight in ounces or 8 glasses per day. Get enough vitamins and minerals in your daily diet. Speak to your doctor about taking a prenatal vitamin and mineral supplement as needed. In addition to a good diet, supplementing the mineral chromium has been found to be very beneficial because of its ability to improve glucose metabolism and reduce insulin resistance in gestational diabetes. Prior to using any of this information, please consult with your doctor. There are numerous situations and circumstances out there and no diet is right for everyone.